For most people, going to the theatre is a pleasant, culturally enlightening and stimulating experience. The majority of modern theatres are salubrious environments with comfortable seats, pleasant ambiances, and places where theatrical devotees can avail of food and beverages. People who attend the theatre are looking to be entertained and with this in mind, they take their seats comfortable in the knowledge that an entertaining night awaits them at their favourite theatre. However, followers of theatre of the Absurd, encounter a vastly different theatrical experience from other theatre aficionados. Innovative playwrights developed absurdist theatre in the 1950s in show houses across mainland Europe with France being the foremost place of origin for the new theatrical form. Theatre of the Absurd is concerned with depictions of the human condition and in most cases; it depicts it as being meaningless. Characters appear to be lost with their lives have no sense of purpose or direction. Important theatrical devices such as time, place, language and identity break down in Absurdist theatre. In staging absurdist plays, directors use minimal staging and refuse to give their plays a meaningful plot. Babbling and incoherent dialogue characterises absurdist plays. Typically, plays of this type revolve around dreams and in many cases the characters experience nightmares of terrifying nature. Samuel Beckett is perhaps the most well know originator of theatre of the Absurd. His play Waiting for Godot is a prime example of an absurdist play, which Beckett aired at the Theatre de Babylone, in Paris 1953. The play centres mainly on two characters Vladimir and Estragon and Beckett’s play utilises the aforementioned features of absurdist theatre such as lack of plot, timeline, place and language. 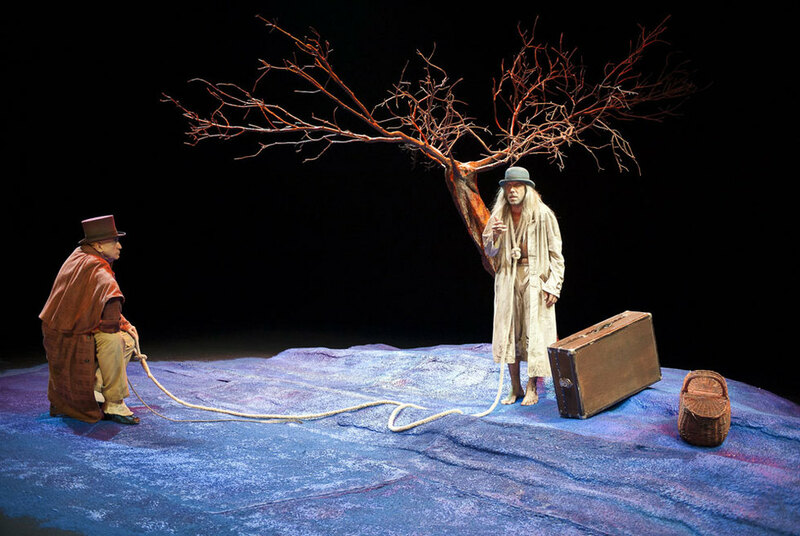 Overall, there is minimal moment in the play and the primary characters Vladimir and Estragon appear to be stuck in a physical, emotional and psychological time loop. Most importantly, Beckett’s plays highlights the meaningless of life and the human condition in the wider context of international warfare, corrupt governments, consumers driven societies, dishonest societal institutions and intrusive corporate companies. Theatre of the Absurd distorts and unsettles the viewer. In the absence of recognised theatrical devices, strange events on stage unnerve the audience, as they do not know what is coming next or how to react to what the actors are doing. For Beckett, this is the exact reaction, which he wanted Waiting for Godot to create. He did not want to produce a visually pleasing and rounded realist play. Rather, Beckett wanted to jolt theatrical devotees out of their everyday lives and experiences in order to force them to confront the negative aspects of the human condition, the disturbing elements of contemporary society and the dehumanising nature of corporate businesses. Attending an absurdist play such as Waiting for Godot is certainly a unique experience that will leave a lasting impression on the viewer. Therefore, the next time you are considering a pleasant evening at the local theatre, instead of going to a mainstream play that gives you a recognised theatrical structure, why not go to an absurdist play. Such plays challenges you in so many ways while forcing you to engage in an active manner with the material that you are witnessing.